​Each of us have desires – strong desires for endless beauty and joy, endless love and delight, endless security and happiness. These desires are written into our very being and each vocation provides a path to respond to these deep longings. Our vocation as consecrated women takes us directly to the Source of these deep longings, into a deep and intimate union with ultimate Love, Beauty, Goodness, Truth, and Joy. Our life is a response to His call of love – it a gift of self to our Beloved. For vocational discernment or questions regarding our way of life, please complete our Vocational Inquiry Form. “Come, follow Me.” The initial call of Our Lord to the Holy Apostles of long ago is still heard today in the hearts of the many people our Lord chooses to be His own. Total consecration as a religious in the Church is a tremendous gift that we receive from God. It is not of our choosing or making; it is His work from the beginning to the end. This gift once received must be cherished and followed, springing from a relationship of love with the One who we know loves us. As God calls, we find welling in us a need to respond, to give back to Him all we can. The soul being called will find that it is not enough to give God, her time, treasure or talent. She knows what is being asked of her is much more-only the total gift of self will suffice to answer what is being beckoned from her. Jesus asks her to allow herself to be set apart, to belong to Him alone so that in the footsteps of Our Lady she may be an echo of His life here on earth, a life that is lived no longer for herself, but for God and for others. If the Lord has whispered such a desire into your heart, be not afraid! You are not alone in this experience of His love. With the courage of Our Lady, say in union with her, “Be it done unto me according to Thy word.” Embrace where He is leading you, for in His Holy Will in your peace. How do I know if am called? The call begins with an attraction to the religious life. If this life interests you, spending time with the Beloved will help you discern if He is calling you. Assisting at the Holy Sacrifice of the Mass on a daily basis, spending time with Our Lord in adoration, and praying the rosary are essential ways of drawing closer to Jesus so that you can hear His voice. Entrusting yourself to the Immaculate One and asking her to make the way clear for you, will reap tremendous results. Our Holy Mother loves us and in calling upon her aid you will be given both answers to your questions as well as the courage to fulfill the Will of the Father. Working with a spiritual director you can trust is also most helpful. A good spiritual director will help you discern what is truly of God. Visiting communities that interest you will give you experiences from which your discernment can draw. These visits will give you a clearer picture of religious life and help you determine if you are called to the contemplative or the active life. The contemplative life (monastic or cloistered) offers the gifts of prayer, sacrifice, labor and study to the Church, while the active life offers gifts of prayer and good works to the Church. Active sisters share the fruits of their contemplation with the world, but they are never of it. Contemplative sisters are completely separated from the world. Whether contemplative or active, each sister lives for God alone and is given completely to Him. In visiting communities, spending time in prayer, working with a spiritual director while Our Lady acts as your guide, you will hear His voice. When He manifests His Holy Will to you, embrace it and say with the confidence of the Blessed Mother, “Fiat”. A spirit of sacrifice: an ability to give up lesser but more appealing goods for the greater, spiritual ones. A spirit of zeal: that special form of charity that inspires one to generously and joyfully bring all to know Jesus. For the candidate to become an aspirant, the community sees in the young woman signs of the communal charism - the gift from God given for the service of the Church to both the Community and to the individual members for His glory and the salvation of souls - and indications of the ability to live the life. 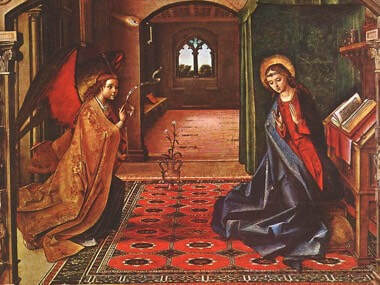 The candidate has in turn seen that the life of the consecrated bride of Christ is beautiful and that our charism and way of life may be the place in which He wishes to fulfill the desires that He has placed in her heart, desires of belonging more fully to Him and of giving her whole self in His service. On entrance day, the candidate knocks on the door of the convent, asking to be admitted as an aspirant to our way of life. Entrance marks the end of an often difficult period of discernment in the candidate's life, but the discernment does not cease with entrance. In a sense, a more intense period of discernment begins. ​Now is the opportunity to see how well the aspirant and the life match: does she have the physical stamina necessary to live a life fully given? The intellectual maturity to join our pursuit of Truth by learning? The emotional maturity to flourish in community life characterized by unity through charity? The early stages of religious life provide the candidate with the time and guidance she needs to determine if, in fact, God is calling her to this way of life, in this particular community, living out of this particular charism, serving this particular Church, in this particular manner. It is a time of beautiful opportunities for growth in all the human as well as intellectual and moral virtues, to grow in the spiritual life, and to fall deeply in love with Christ Crucified Who has been whispering to her heart and communicating to her His Loving Presence and plan for her life. We pray that each young woman who knocks on our door as an aspirant grows in her love of Christ Jesus and in her ability to perceive and receive His love in all the aspects of her life. We welcome each "little Sister" into our religious family with open hearts and loving prayers, recognizing that she may be our sister for life, according to God's Holy Will. 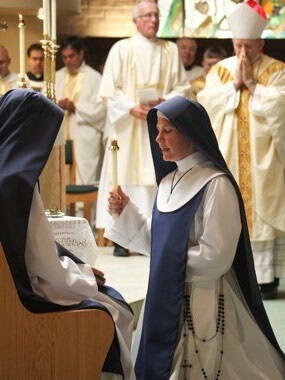 After a period of candidacy has been completed, the candidate is received as a postulant and clothed in the distinctive garb of a postulant of the Marian Sisters of Santa Rosa. At this time, she is placed especially under the patronage of our Immaculate Queen through investiture in the Medal of the Immaculate Conception, which each Sister wears over her heart as a sign of her consecration to Jesus through Mary. The period of postulancy (derived from the Latin meaning "to ask") is a time for the postulant to become familiar with, and to assimilate as her own, the way of life and customs of our community. The young Sister is given the opportunity to learn our manner of life by sharing in the assignments and duties of the community. 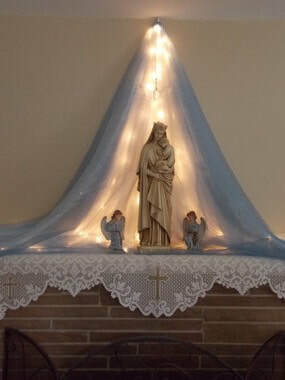 Under the guidance of more experienced religious, she is trained in the work of the sacristy and care of the chapel, the preparation and serving of community meals, the care and maintenance of the convent common spaces and grounds, and is lightly involved in the various external apostolates of the community, learning to do each for Jesus alone in the spirit of a Marian Sister. She also joins in the studies common to the house of formation - courses in philosophy, theology, various aspects of religious life and consecration, the spiritual life, prayer, the charism of the community, and St. Louis de Montfort's True Devotion, as well as courses in human formation. These studies combined with the living of the life allow the postulant to integrate the life practically as well as intellectually and to further discern God's will. Above all else, the postulant is formed in the spirituality of the community and aided to foster that relationship with God that is the foundation of the consecrated life. The period of postulancy allows the Sister to be more radically converted to Christ, Who is to be her Divine Bridegroom. 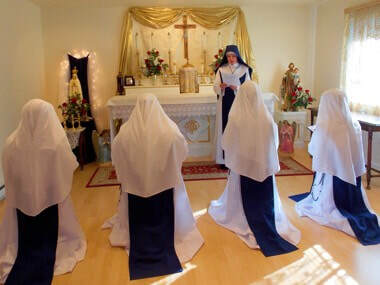 This period lasts eight to ten months, at the end of which, if the postulant continues to hear God's call to our way of life, she may be invited to write a letter requesting the community to prayerfully consider receiving her as a novice, at which time she would receive her religious name and be clothed in the habit of a Marian Sister. 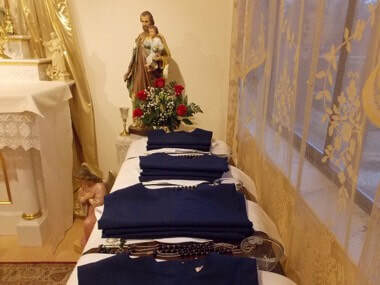 Clothed with the holy habit, a reminder that she is to put on Christ each day, she grows in knowledge and love of Jesus by living the poor, chaste, and obedient life that He lived, first in the Nazareth of formation, and later in the public apostolate of the community. The habit is her bridal gown. Its white represents the spotless innocence of her soul after Baptism and she takes care to keep her habit clean and tidy, just as she seeks to keep her soul spotless. By its blue, she is clothed with Our Lady’s color and is reminded to ever fix her eyes on this gracious Mistress that she may reflect her as she reflects Jesus to her Sisters and to every soul she meets. Her white veil, her bridal veil, indicates her newness to the life and her eagerness to belong more completely to Christ. The Rosary at her side reminds her to enter each day into the Redemptive mysteries of Christ’s life, praying that she might have Mary’s eyes to see everything as He does. A spirit of love for the Church and its sacred pastors. Called to holiness by its baptism into Christ Jesus, each Christian soul endeavors to imitate the Divine Model. Chosen to mirror Christ in a most radical and visible manner as His Spouse, the religious woman draws on the graces of her baptism to respond to His call. 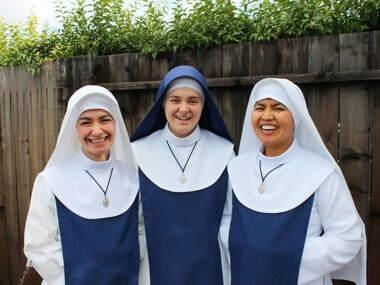 After living the life of the community in the novitiate (where the novice learns to understand the beauty of the vocation to the consecrated life, strives to cultivate virtue, develops and strengthens a deep prayer-love relationship with Jesus Christ, and is instructed in the manner of life of the particular community), the novice who freely desires to give herself entirely to the service of Our Lord and His Church, and who has been approved by the community, is permitted to make her first profession of the evangelical counsels. The Sister’s perpetual profession of vows is a solemn and grace-filled moment. It represents the moment when the Church affirms, ratifies, and makes permanent the response the Sister made to Christ’s loving call many years before. She professes the evangelical counsels of poverty, chastity, and obedience according to the rule of life of our community, committing herself to ever strive for perfect charity in our way of life. By perpetual profession, the Sister enters into a spiritual marriage that is unbreakable. A spousal bond is ratified that embraces the Sister to the very core of her soul and binds her to her Beloved with an unending bond. This consecration, deeply rooted in baptism, is one of thanks and praise through Jesus Christ, the Spouse, who taught by His whole life the perfection of chastity, the richness of poverty, and the depth of obedience to the point of dying for us. The Sister’s gold ring, engraved To Jesus, my heart, my all forever, symbolizes this configuration. This relationship and reality marks every part of her being and is reflected in her actions and choices. "Cleanse me, O Lord, and purify my heart that being made white in the blood of the Lamb, I may have the fruition of everlasting joys." Our holy habit is more than an article of clothing. When a Sister is clothed as a novice, Mother assists her to put on the habit, representing the Sister’s putting on of Christ Jesus Crucified. This habit will be her constant companion throughout her religious life. It is her bridal gown and when she goes to meet her Spouse face-to-face, she will be buried in it. It allows each of Sister's "children" to recognize her as their spiritual mother - even if they have never seen her before or will not see her again in this life. It is the visible sign of her consecration that enables the complete stranger to confide in Sister and ask for prayers, knowing that Sister will carry them in her heart when she speaks to her Divine Spouse. Made timeless by its very antiquity, the religious habit speaks always and everywhere of the realities beyond the present. Each Sister gladly left off her favorite style of worldly clothing to put on this simple reminder of what a glorious waste her life has become, totally given over to her Beloved. All of her energy, her love, her time, her talent, has been poured out - wasted - in His service. It has become His time, His talents, HIS, all His, just for Him. Sister’s habit sets her apart, even from the family she loves with all her heart. She is set apart, not to be cut off from them, but so that she can serve and love them better. Her total gift of self to Christ enables her to love them more purely, not for what she receives from them, but for who they are as souls given by Christ to her care. She carries them, along with all her other spiritual children, before her Bridegroom each day, imploring for them His grace and protection, and asking for their eternal salvation. "Why do you look so beautiful?" a little girl asked Sister. The little one wasn't taken by Sister's flawless external beauty (she doesn't "measure up" to society's elusive beauty standard). This child's innocence was captivated by Sister being a faithful reflection of her Spouse. 'Tis a beauty that can bear the heat of the day and the daily cross. The faithful company of these trials enhances her beauty because they increase in her the supernatural life of her Spouse. Her white habit reminds her throughout the day of her soul's baptismal innocence. Her life of consecration is aimed at a more perfect living out of her baptismal promises, and the care she takes to keep her habit white reflects the care she has to avoid even the smallest of offenses against her Divine Bridegroom. As Sister fastens the familiar pins each morning, she prays for her own sanctification and perseverance in grace, saying, "O Lord, Who hast said 'My yoke is easy and My burden is light,' make me so able to bear it that I may obtain Thy favor." As what is sacred is veiled, so Sister’s heart is covered by the white cowl to signify that Jesus dwells within by grace, that He comes to her in the intimate union of Holy Communion, and that He reigns therein as its Sovereign King. She prays, "Cleanse me, O Lord, and purify my heart that being made white in the blood of the Lamb, I may have the fruition of everlasting joys." 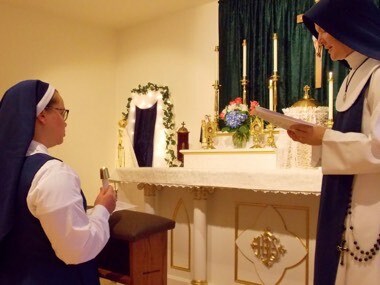 Continuing to hold her loving gaze on her Beloved, she prays, "Place, O Lord, the helmet of salvation upon my head, that I may overcome the assaults of the devil.” Before she received her bridal veil for the first time, she said farewell to her hair. However short or unruly it may have been, it was her hair, the external sign of her femininity. This sign too, has been left behind, not because it was not good or beautiful, but precisely because it was good and beautiful it was given to Him. Never again will the world see this aspect of her beauty. The Sister's response: "My soul doth magnify the Lord! He hath done great things for me!" as she gladly pins on the holy veil by which it is known that she has rejected the world to humbly and obediently follow her Spouse with trusting confidence in His loving desire to lead her into life eternal. 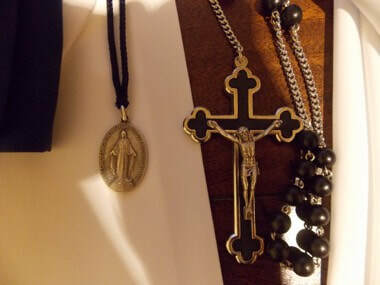 "God forbid that I should glory, save in the Cross of Our Lord Jesus Christ, by Whom the world is crucified to me and I to the world," Sister continues, kissing the crucifix as she clips on her Rosary, brought back by that simple yet exquisite act to the moment of her clothing when she was first presented her Rosary crucifix to venerate. As she slips on her shoes - plain, sturdy shoes that have seen many miles in the Lord's service, shoes that have hastened to the aid of a Sister in need, carried Sister in the service of her children, supported her during her hours of prayer, and been gratefully slipped off at the end of the day - the Sister prays, "O Lord, teach me to walk in Thy footprints and preserve me from stumbling; guide my steps in the way of salvation. May Thy holy angel direct and guard me. Not according to my own will, but purely in obedience, I will take every step." Kissing her simple ring as a renewal of her vows, Sister leaves her cell, following her Beloved’s call to prayerful union with Him, her will fixed on doing His will in each moment of the day. “…And You Are Christ’s” by Fr. Thomas Dubay, S.M.